What a great idea to employ Chocolate Candy For Weddings. Almost everyone loves chocolate candy, so you can hardly go wrong. Seriously, I love a chocolate candy wedding favor. Any excuse to enjoy chocolate works for me. There is a wide range of ideas you can create or purchase depending on your own personal taste and budget. Show off your own wedding favor ideas here! I was on a very strict budget for my own wedding, so I made my own favors using a handful of candy, squares of tulle, and a bit of ribbon to tie them closed. They were lovely, and worked for me and my budget, but if I had had more time and money, I would have gone with something a little more unique. You can get quite a range of choices of chocolate candy for weddings from Candy Crate. They sell in bulk, so you get a good price. You can even choose from things like chocolate espresso beans. Browse through their selection and see if something doesn't catch your eye. If you want to make your own chocolate candy wedding favors from scratch, you can use any of the recipes on this site for truffles, fudge, or homemade chocolate candy, and then package them yourself like I did. This is the most economical way to go, of course. You can get the mini boxes or little cellophane bags at Candyland Crafts or other craft items, like tulle, at your local craft store for whatever clever idea you come up with. I love this idea, and I can't wait to use it! No, I don't intend to get married again (I'm in it for life), but I do plan to use this clever but economical favor for other special occasions. I adore Hershey's kisses and this is such a cute way to use them for party favors. All you have to do is purchase your chocolate kisses in bulk at Candy Crate (they have a whole range of flavors available), or for that matter, you can pick up a couple of bags the next time you are in Walmart or the grocery store. Next, order custom stickers that fit just right on the bottom of the kisses. You will find a great selection at Memory Wraps, and also at Candy Wrappers. They will sell you the personalized stickers by themselves, or you can even have them place the stickers on the chocolate kisses and buy them already done. How easy is that? This is a really great yet economical way to enjoy chocolate candy for weddings or any other special event. My niece had adorable personalized candy bars made up with the bride and groom's name, the wedding date, and other personal details printed on them. They were really cute, and yet seemed sophisticated at the same time. 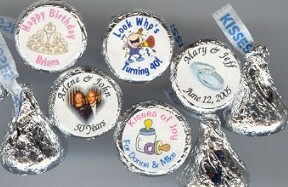 Personalized Candy Bar Wrappers can be special ordered from Memory Wraps or Candy Wrappers. Just like with the chocolate kisses, you can either buy the wrappers with or without the chocolate. The choice is yours. If you have a computer and printer, you can actually design and print the wrappers yourself with the amazingly inexpensive software from Custom Candy Wrappers or The Dapper Wrapper. Compare the two and decide on which one is right for you. I love this software because you can use it for any occasion, likebirthdays, an anniversary, graduation, or homemade family holidays, too. (We are big on those in my family). 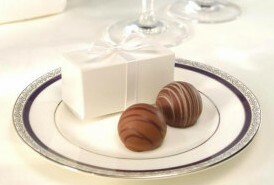 Another gorgeous idea for chocolate candy for weddings are individual boxes with two truffles in each one. They are pretty, conveniently packaged, and delicious. You can purchase these all made up and ready to go at Dan's Chocolates and, of course, at My Wedding Favors. If you discover that those are a bit beyond your budget, you can order large trays of truffles at Dan's Chocolates and then package them yourself with supplies from Candyland Crafts. This will cut the cost considerably. 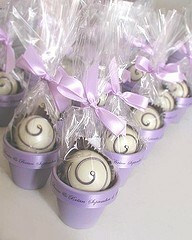 Chocolate spoons make really nice wedding favors. Again, these can be made yourself or special ordered from My Wedding Favors. Another beautiful idea for chocolate candy wedding favors is to make molded chocolate candy. 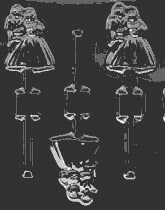 You can choose from heart shaped molds to bride and groom molds, or even lollipop molds. These can be a lot of fun to make, and your guests will love them. Unfortunately, I am not very creative in my own right, but I am happy to use ideas from others when they are willing to share. If you have another idea for chocolate candy for weddings that either you used yourself, or maybe received as a guest at a wedding, I'd love to have you add your chocolate party favor to the list. My advice for the wedding is to make it as lovely as you can, but don't let yourself get your priorities out of balance. I've seen too many people spoil their special day by worrying too much over the small things that don't really matter in the long run, and hurt people's feelings, or get their feelings hurt in the process.